Our pig pen finally started to move towards the start line and soon after we were of running the 2012 Flying Pig Marathon. The crowds at the start were exciting, and I decided not to listen to my iPod Shuffle and instead enjoy their cheering. In fact, the ear buds for my iPod would never make their way out of my fuel belt. We ran together for maybe a quarter mile before she took off as we crossed the Taylor-Southgate Bridge into Kentucky. I walked up the incline (I was planning on walking all inclines during the course). Molly had reassured me that Wendy and Emily were behind me, so I looked forward to them passing me. Running through the Kentucky portion of the race was fun. The crowds were out and I enjoyed running through Covington, the neighborhood we were staying in. By the way, I totally loved the iFitness iPhone belt add-on I picked up at the Expo the day before. For the Disney Marathon they had run out, and I’ve been looking to pick one up since. It made getting my phone in and out to take these photos while running super easy! I was feeling the heat already and was glad I remembered to apply sunscreen before we left the house. These were being handed out just before a water stop, but I don’t think they were provided by the course. I didn’t care… It was the most delicious thing I had ever had. It was a hot, muggy morning, with highs expected in the mid 80’s. Around this time I could feel my IT band already tightening up. By the time Wendy and Emily passed me without recognizing me around mile 8, I was having trouble bending my knee. I called out their names and they turned around surprised. We would run together for the next six miles or so. This is when my right leg said “I’m not going to bend anymore.” Well, I showed my stubborn IT band who’s the boss: I figured out that if I swung my leg around when I ran (think pirate on a wooden leg) that it wouldn’t hurt. Sure, I looked like a special case but at least I was covering the distance. Around mile nine is the half marathon turn-off. The girls asked what I was going to do. I finally told them I was going to do the full marathon, but only under the condition that they would leave me. I knew there would be a point I could no longer run, and didn’t want to hold them back. As my pain increased, we stopped at an aid station to see if they had Biofreeze or aspirin. No such luck, all they had was Vaseline. What kind of aid station is that? However, if you’re running a marathon and say the word “pain medicine” loud enough several times, you’re bound to have a kind runner overhear you and offer up some of their own. I was this fortunate when we met the loveliest lady. I declared my love for her as she gave me two Advil, but sadly I cannot remember her name, other than it started with the letter ‘R.’ But I will remember her fondly. That beer was hands down the coldest drink I had during the entire race course. I relished it. So did Emily and Wendy. That orange headband around my left arm is what I used to cool myself off. At every water stop I would dump water on it, then wipe myself down with the headband. It’s easier than carrying a rag and definitely helped to keep my temperature down. Wendy and Emily kept asking me if this was still the best day ever and I kept answering with a “yup.” No one ever said the best day ever was going to be easy. Shortly after that picture was taken I finally decided I could no longer hobble run, chasing after the ladies. After the next running interval started, I continued to walk. I think they knew it was time and off they went. I would be on my own for the next 12 miles… or so I thought. Apparently he had juggled his way through the 10k the previous day and was now on day two of run juggling. I was mesmerized. I even started to run again so I could stay near him longer. Once again I was about to put on my headphones when I heard someone asking me if I was okay. “Oh yeah, just can’t bend my leg. No bid deal, just running a marathon,” I responded. It’s the same response I had given at least ten people already. However, this runner had some items of much value: IcyHot (yes, he was carrying an entire tube in his pocket) and Advil. He offered me the Advil and IcyHot and I didn’t even hesitate in answering with a big ol’ “YES!” Since I had already taken drugs and alcohol from other perfect strangers, I thought why stop there? When he handed me the Advil, he pointed out that it said ‘Advil’ on it, so I didn’t think he was trying to drug me. I reassured him that even if he was slipping me some Ecstasy, I think I’d be okay with it. Yup, that’s how much pain I was in… I was willing to finish out the rest of the marathon in a drug-induced trance-like state. Lucky for me, it really was just Advil. The final 10 miles of the marathon consist of highway hill running and running through not the nicest of neighborhoods. This reminded me of the long stretch during Disney where you run on the highway and I started to resent it. Here’s a pic of me at mile 22. I was holding a styrofoam cup full of ice that we had scored. I may or may not have professed my love for the stranger that handed me said cup full of ice. In the photo above, you’ll see that the road has some pretty fresh tar. I’m not sure if they patched up the road for the race, but it was so hot that the tar was sticking to my shoes. I had to make a concerted effort not to step on it. Around mile 24 I saw a church with a sign that said “restrooms” outside and made a dash for it. Making it up the stairs to the entrance was a little tricky though, but the promise of an air-conditioned restroom helped guide me. The final two miles of the marathon were horrible. It was all highway, and by this point the sun was torturing me. It was relentless. And the water and Gatorade got so hot at every stop that I couldn’t drink it. All I could think about was ice-cold water. And being able to sit down. I started to wobble run when the finish line was in an attainable distance. I crossed the “finish swine” in 7:03:10, hobbling every step of the way. My average pace was 16:10/mile. My right leg was throbbing. My throat was parched. My feet were swollen. I had joined the ever-elusive 7-hour marathon club. But I didn’t give up. Rox and Rachelle were just about some of the last few spectators remaining. Thank God for friends! I thanked Will for the company and headed off in search of iced-cold water. I would not find ice-cold water, but I was , however, greeted with a beer by Erin. I declared my love for her too. Me, putting the pig in a choke hold. Did I mention we had piggy tails? Because we totally did. Balancing on my bad leg while holding my beloved beer, and the ice bag that Erin was able to get from a vendor. No beer was spilled in the taking of this photo. I’ve never been to Cincinnati and had a great time exploring a new city. The crowds were amazing. The people were lovely. It was a scenic course that took you through the city, over bridges, along the water and into the hills. Oh my! I love the pigs. Everywhere. Ohio weather in May is tricky. Last year it rained. This year it was hot. I would suggest race organizers talk to race organizers from Florida for tips on how to keep runners cool: more ice, sponges, etc. Hills. Train for them or they will eat you up alive. Aid Stations didn’t have pain meds or Biofreeze. I thought this was a race staple! Bring your own. Don’t take 7 hours to run your marathon. If you do, all of the volunteers at the end will have packed up, and you’ll get nice warm water. Final verdict: I would like to run the Flying Pig Marathon again one day, but with two good legs. However, I would much rather just run the half marathon, and skip the awful highway portion that makes up the back half. Thanks to everyone for your well wishes and support! A big shout out to the six wonderfully crazy ladies I travelled with and also the ones that couldn’t make the trip, but still sent their love. 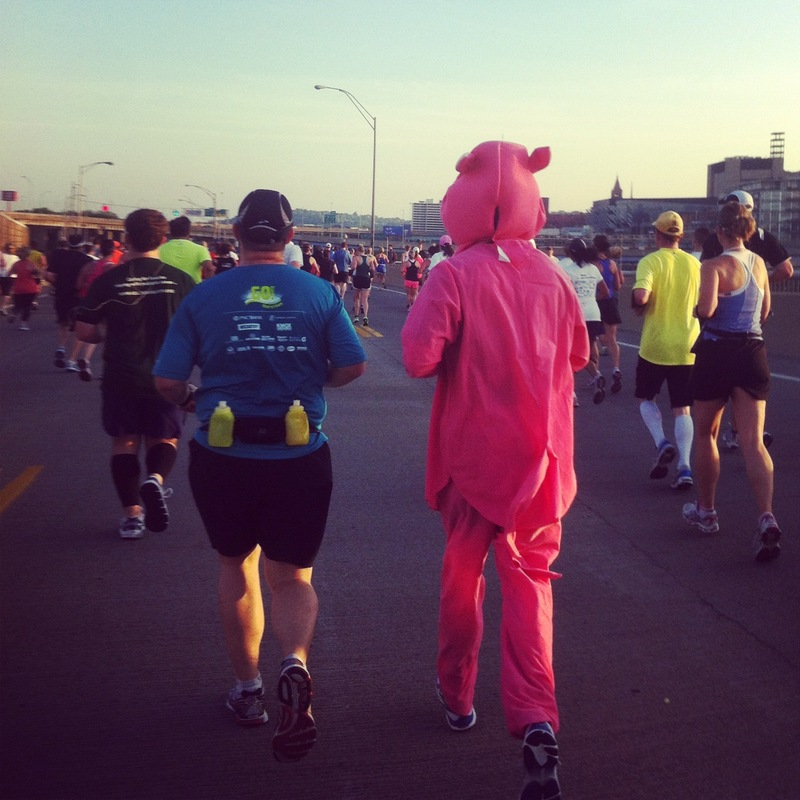 Have you run the Flying Pig Marathon? Tell me about your experience or link to your own recap in the comments! On Sunday morning shortly after I woke up at 4:15 AM, I said “this is going to be the best day ever.” I was, of course, being highly optimistic. 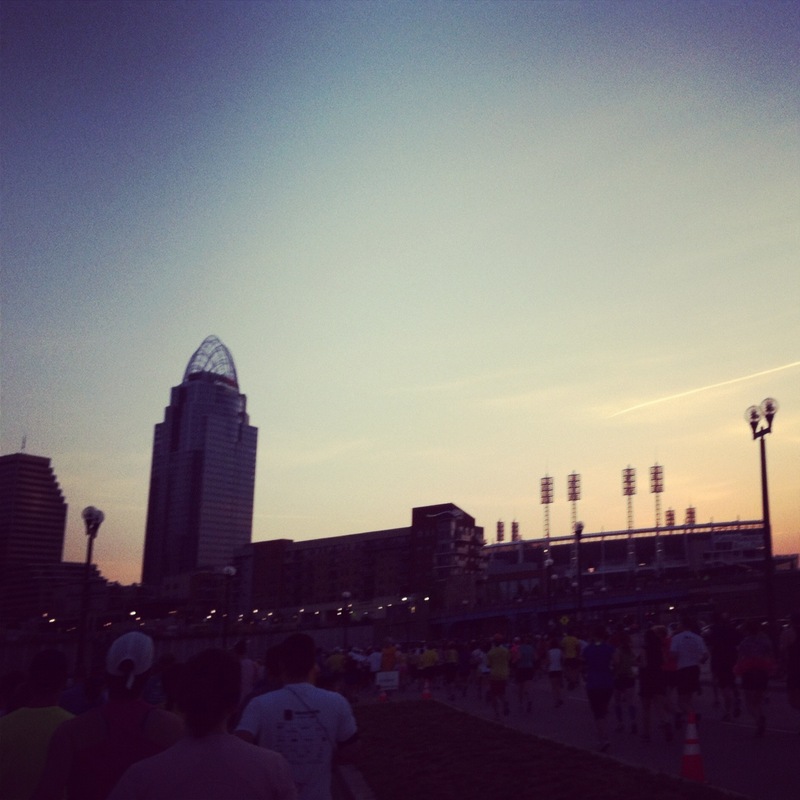 It was the morning of the 2012 Flying Pig Marathon. After over a month of having issues with my right IT band (I blogged about it here and here and here and here) I knew what I was potentially walking into. But because of how fabulously stubborn I am, I decided I would still participate in the Flying Pig Marathon, even if I had to walk it. Or crawl it. 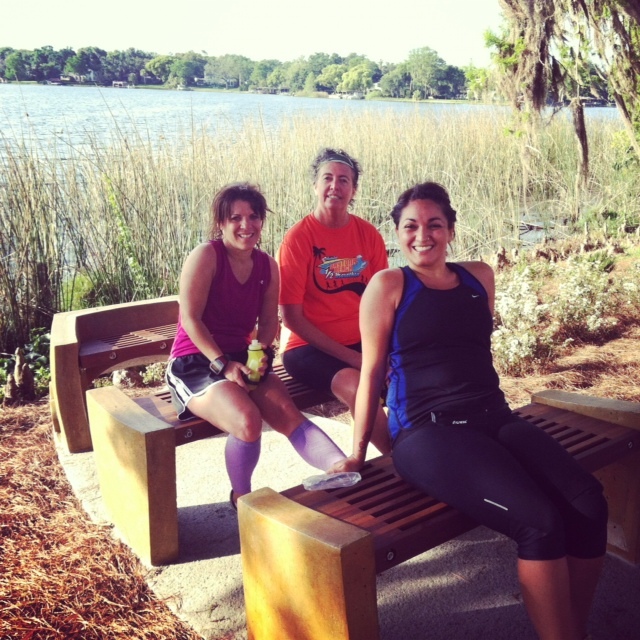 Let me start at the beginning: I run with some really fun and amazing ladies. Earlier this year, a group of us decided to run the Flying Pig Marathon and Half in Cincinnati, OH. I was just coming out of my first marathon, and determined to get right back on that horse. The rest of our group left the house around 5:40, while Rox and I ran fashionably late. This is not new for us. We’ve run several races together, and I’d say we’ve been running up to the start as the gun goes off for about half of those. We left the house around 5:50 AM. We were just about to start crossing the bridge into Cincinnati when Rox looked down at my knees and asked where my IT band straps were. An expletive flew out of my mouth. I had forgotten to set those out, therefore forgetting to put them on. We followed the crowds towards the stadium and started to feel the energy created by thousands of runners ready to run their hearts out. The corrals, or pig pens, at the start. We stretched during the intro then Rox and I wished each other luck and split up to join our separate corrals pig pens. I tried to find the rest of the ladies, but had no such luck. I set my watch, stopped to say a prayer for strength and waited for my coral to start the race. 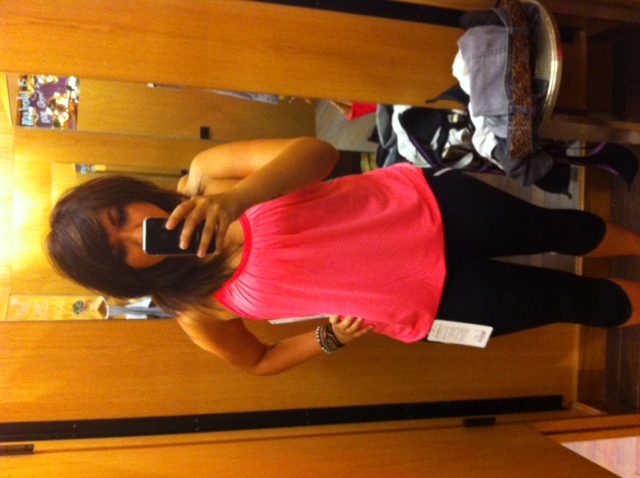 Yuppers, I got myself the Lululemon no limits tank in hot, hot pink for marathon day. I ran my first marathon in a no limits tank (in a different color) and had absolutely zero issues with chafing or the shirt riding up so I think I’m safe running in the same top without having actually taken it for a long test run. I will, however, wash the shirt so I don’t bleed hot pink (though that may be cool). I think the color is perfect for Flying Pig, don’t you think? A couple of weeks ago I got the crops in the photo. They are the run: a marathon crop, also from Lululemon. I’ve done a couple of runs in them (one long run and one short) and they were great: the bottoms of the legs didn’t ride up and the top is higher wasted and didn’t ride down. And they passed the very-important-for-all-tights-bend-over test (when I bend over the pant does NOT get transparent). Perfect! Yesterday I read this post by Meghann of Meals and Miles and it made me chuckle. I am in complete agreement with her when she wrote “I’m a big believer that a big race deserves a new outfit, sorta like a big date requires a new dress – am I wrong?” Nope, not wrong at all. If you’re running your first half or full marathon, I would recommend you buy your new outfit a month before your race and wear it during a shorter long run. If it passes the test (no chafing, riding up, etc.) then wear it for your longest run. It’s amazing how a few miles can alter the wear of your running outfit. For example, I have a singlet that I wore in different colors for all three of my half marathons without any problems. However, when I wore one of them for an 18-mile run, I was surprised to see severe chafing on the inside of my arms. It was so bad I was bleeding! Needless to say, those are now restricted to runs 13 miles or shorter. I consider this running outfit quite the splurge, but I’ve worked hard the last four months (and seven months before that training for Disney) and I like that I’m at a place where I can reward my hard work with a splurge like this. In my future I’ll have kids and a home to worry about and these days will be long gone. I’ll enjoy it while I can! What do you do for your race-day running attire? Yesterday morning I went for a 3-mile walk with Emily, one of my group leaders. She’s running Flying Pig with me so it was nice to catch up and do some race day strategizing. Afterwards I rushed home to start my day with some yoga. I took it easy with this Yoga Vibes class, focusing on the outer hip and IT band. Four days until the Flying Pig Marathon! Every now and then you come across a person, or in this case a story about a person, that just stops you in your tracks and leaves you with so much emotion that you don’t know what hit you. This news piece on a deaf, blind man about to walk the Flying Pig 5k did just that. Deaf since birth and blind for many years, David Conroy likes to pursue lots of interests. “The thing about being deaf and blind is you get really bored,” stated a LADD employee in the video. That statement hit me like a rock. I cannot fathom losing either my hearing or my sight, but to lose both? That’s incomprehensible to me. I’ve sat here for a while trying to even grasp what that would be like, and can’t. And yet, it’s David’s life. And he chooses to live with the sort of courage that I only read of. I want to walk away from this learning from David. I want to stop being such a spoiled brat who takes my health everything for granted. I want to appreciate more. I want to remember David when I set out to run the Flying Pig Marathon Sunday morning. I want to look at this world with fresh eyes. I want to possess just a small piece of his incredible perseverance. And most importantly, I want to be brave. Since I had to recently alter my Flying Pig Marathon training plan and take a week off from running in order to do some healing on my IT band, I decided to fill my run time with yoga. Particularly yoga that focuses on stretching my hips and IT band. After a quick “best online yoga videos” search, I came across this article on Livestrong.com. The ‘yoga for athletes’ series on YogaVibes.com caught my eye and I went to check it out. After seeing that they have a free 15-day trial, I realized how perfect this would be for me. With only 20 days left before my 2nd marathon, this would be perfect to tie me over. And if I don’t cancel my membership at the end of 15 days, I will start being charged $20 per month. That’s not too shabby considering I’m currently paying $15 per class. This would allow me to do more than one yoga class each week! This afternoon I opted for a 72-minute outer hip and IT band focused vinyasa flow class in the Yoga for Athletes series. It was just what I needed! I took my computer out to our Florida room and set it on a small table a couple of feet ahead of my yoga mat. The teacher, Sage Rountree, was great! I liked that she was a runner that started yoga for it’s benefits to long distance runners. She did a great job of explaining and showing poses and a couple of times she corrected posture for someone in the class and I realized I needed to correct my posture too. It almost felt like I was in the room with them! My hips and IT band feel amazing and I’m currently ridin’ that yoga high. As the days progress, I’ll let you know how I enjoy additional classes in the Yoga for Athletes series. Have you ever taken an online yoga class? Which one? How did you like it (or not)? When training for a marathon (or half) you come across a lot of decisions you have to make. Sometimes there’s the small decisions like “What should I eat for dinner the night before a long training run?” or “Which flavor energy gel should I buy?” Then there’s the bigger decisions … the ones that can make or break your race day run. Currently I’m dealing with the latter. After last week’s failed 20-mile run, I knew I might be in trouble. Usually when my IT band starts hurting towards the end of a long run, I’m okay after some ice and a few hours. But this was “I just ran a marathon” pain, yet I had only run 12 miles. It hurt to walk on the beach the next day. It hurt to roll and stretch my right leg. It just hurt. Tuesday morning I woke up for a 4-mile run in the morning. The first thing I did was stretch and immediately knew I wasn’t ready. I texted my group and went back to bed. Wednesday night I went to yoga for a Hatha class. It felt like my instructor knew what I needed, and every muscle in my legs and hips were stretched. I felt amazing! Thursday I woke up for a morning run and again stretched. I thought I was ready, and met my group for a 5-mile run. Three miles in, I felt that old familiar twinge and as we were nearing our ending point (a conveniently chosen Starbucks), I started to feel sharp pain. If you’re wondering why I didn’t walk it in as soon as I felt any pain, it’s because I was on a schedule. Not only did I have to go into work early that day, but I also had to pick up bagels for a friend’s birthday. If I walked it in, I would be late. As that run was ending, I knew a second attempt at running 20 miles wasn’t going to happen today. I made the hard decision of skipping this morning’s training run. I don’t know how many times I’ve heard the advice “It’s better to run undertrained and injury-free on race day than trained and injured,” and how many more times I’ve actually told fellow runners that. Oh, how that’s easier said than done. The irritation might not go away before my marathon. It’s only three weeks away. But if I’m diligent with my icing, Advil-taking, stretching, rolling and strength training, I may delay the IT band irritation and limit how many miles I run in pain. No running for one week. That means I didn’t run this morning, and Tuesday and Thursday are out as well. I will do yoga, stretch, roll and strength train in it’s place. On Saturday I may join my group for a short run. I am still running the Flying Pig Marathon! Mind over matter. Who cares if I can’t run today? Who cares that my longest run this training season was just over 18 miles and it will have been over a month before race day? I can let myself (easily) go down a road of self doubt or I can focus on the positive. I choose the latter. Before my right IT band acted up I had two great runs! And I hope it makes all the difference on race day. Weeeeeeeeeeee! Have you gone into a race undertrained and healthy and/or trained and injured? Tell me about your experience in the comments. Earlier today I posted my April Fool’s blog for the day, announcing that I was going to quit running. If you read down to the bottom, you caught that I would denounce this decision by Tuesday morning, when my next run is scheduled. Hee hee. Since yesterday’s long training run was to be 10 to 14 miles, I set out for our run at 6 AM with the intent to run 10 miles. This is what happens when you give me a range… I mentally commit to the lowest mileage. However, the stars were aligned yesterday and I felt so good that I ran just over 14 miles. Aside from the bug that stalked me for two blocks, I thoroughly enjoyed the run. Maybe it was my new favorite yummy running snack, the Vanilla Organic Stinger Waffle, that put a pep in my step. Or maybe it was the Mexican food I had for dinner the night before. Whatever it was, it worked! It really was the perfect day for a run! And with the Flying Pig Marathon only five weeks away, it was good to have a positive run! Afterwards, one of my group mates and I doubled back to Panera. We wanted coffee badly. Afterwards I headed home to begin a weekend of much needed rest. Did you get your sweat on outside this weekend?